In January, NYU professor David Yermack taught a mini-course of three stand-alone lectures at the Stigler Center on the potential implications of blockchain technology for the future of finance. Before we get into the topics that are more focused on macro-economics, I thought it would be interesting to just look at the daily news. These are three stories that I pulled down off of a site called CoinDesk. There are many sources of news about blockchains, but this is the one that I think does the best job. Every day, I read it right after I read the New York Times. You get both a lot of data about the cryptomarkets, but also a lot of news about new initiatives and programs around the world. Just in the last 24 hours, the U.S. Food and Drug Administration put out a request for proposals for using blockchains to track health care data. I mentioned a number of times that public-sector applications may be ultimately the most promising uses of this technology. Having accurate medical records is obviously something that many societies have identified as an important goal, and have struggled with finding good ways to implement. In Sweden, they are introducing a beta test of a land property registry for the real estate markets. This is another idea that has been widely discussed. More often, it comes up in emerging markets that have bad property records or an awful lot of corruption. Places like Venezuela, for instance, would be the ideal uses of this. Sweden is maybe the country that needs this the least of any country in the world, but also may be the one that could introduce it with the greatest ease. It would save money in the real estate market and attach more certainty to the ownership of assets. This is a very interesting thing. In 10 years’ time, you may see this in many countries: moving the real estate registries onto blockchains. Then finally, there’s a funky story about Julian Assange, the WikiLeaks guy who is holed up in the embassy of Ecuador in London. There are rumors that he’s dead, maybe in retaliation for stuff in the campaign, the CIA…who knows. To prove he was alive, he went on the internet last night and read off the hash code from the most recent block in the Bitcoin blockchain that had just been mined. It’s like hostages with headlines in that day’s newspaper. This was a very interesting idea. He has an obvious talent for showmanship. What the blockchain is ultimately about is authenticating that something existed at a certain point in time, and we can all rest a little easier that, in fact, the founder of WikiLeaks is still very much at work. 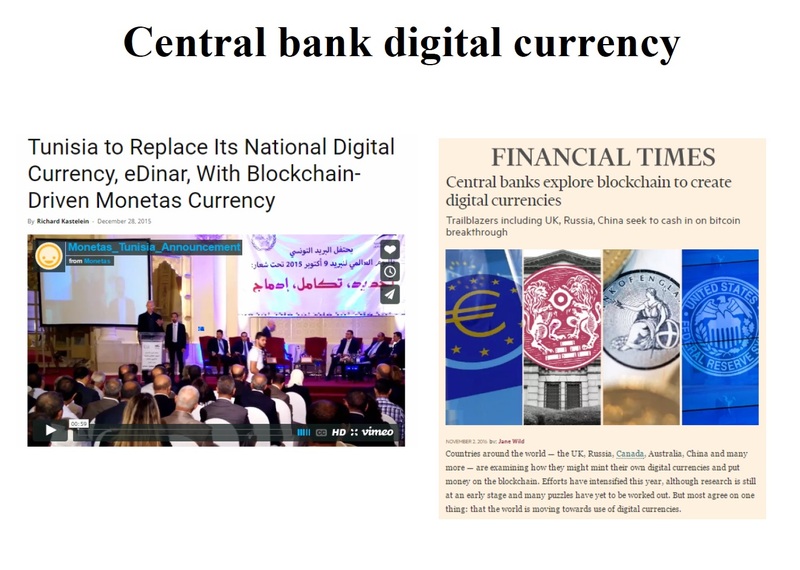 Our topic for today is central bank digital currency, which essentially is taking this wildcat idea that was really created to undermine or compete with the central banks of the world, and think about them bringing that in-house and using it. On the right is a recent story from the Financial Times that simply highlights the fact that many governments around the world are looking at this very actively. The one that you would really want to learn more about, if you’re interested in this, is the Bank of England. About a year and a half ago, they put together a team with a lot of academics and part of their research staff. It’s called The Future of Money. They have put out a number of white papers that essentially amount to a design of what this would look like in the U.K. It gets to an enormous amount of detail about what this would mean for the commercial banking system, for customer payments, and all kinds of externalities, both good and bad—extremely thoughtful treatment of the issue. It’s surprising to come out of a country like the U.K., because they have a very old, conservative traditional central bank and a financial system that, on the whole, works pretty well. They aren’t obviously the best candidate for this. [But] if you’re interested in sovereign digital currency, your first stop should be what’s going on with the Future of Money people at the bank of England. They’ve gotten in some hot water with the British parliament. They’ve actually been called into Parliament to disavow that this is a secret plan, that they’re going to do this next year or something like that. There’s a lot of concern that this is really a political decision that should be made not by the central bank but by Parliament. They’re pretty far down the road, at least with designing this thing. I would point to the central banks in Canada, Singapore. Many, many major countries are now at least looking at this idea. There are two countries that have actually done it already. That’s the news story on the left. Tunisia actually has a blockchain national currency that is legal tender. Just about a month ago [December 2016], Senegal became the second. You have two African countries that essentially have an electronic currency, blockchained and circulating side by side with their more traditional paper money, the bills and coins. This is an idea that is really already here, but my suspicion is that you’re going to see this adopted and spread into some of the more major economies. I think that either Sweden or Singapore are the best bet for who will be the first major large economy, but if the value of this is proven, many other countries will fall pretty clearly in the line. I want to talk about three ideas today that I think are quite closely related to one another. The first is to look at the independent cryptocurrencies, Bitcoin especially, and to make some evaluation about whether these are serious threats to the sovereign currencies that are out there. In other words, if you are Janet Yellen running the Federal Reserve, are you worried about Bitcoin as a competitor to the U.S. Dollar? Is this a serious threat that private money could drive government money out of circulation? If it did, this would put us back in the 19th century, to what is called The Era of Free Banking, when essentially banks issued their own private money. It was either used or not used by the public based on the reputation of the bank. Currencies competed against each other, and governments played a much more limited role in issuing money. 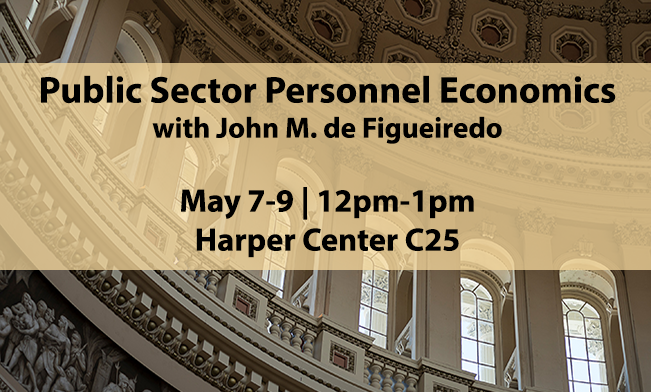 This is something that we all thought had more or less disappeared by the dawn of the 20th century, but one of the interesting things about this is that it puts you back into the world of classical economics from 150-200 years ago. Money back in the 19th century was really backed by gold. Is Bitcoin and [other] blockchain-type currencies really a type of digital gold that would operate much the same way as the gold standard did 100-150 years ago? If you look under the hood of these currencies, the distinguishing feature of them is that there’s a rate of money growth that is pre-programmed. The whole idea with a private currency is that the sponsor of the currency might show more restraint than a government would about printing too much of it. In particular, if you could commit to a rule that everybody knew the rate of future money creation and money growth, it might make money neutral in the economy in a way that has often been advocated by people like Milton Friedman—in fact, a lot of people associated with the monetarist tradition, many of them having taught at this university. If a digital currency can pre-program a rate of money creation that is in some sense better for economic growth and for trade and transactions and so forth, could a central bank commit to the same thing? This is actually a very old debate about monetary policy. There’s a huge amount of macro research that goes into the question of “What is the optimal rate of money creation and if we knew what it was, could the central bank commit unconditionally to following that rate?” This is sometimes called in shorthand the “Rules versus Discretion Debate.” Should there be a rule of monetary creation, or should the central bank have discretion to fine tune it, adjust it in response to emergencies? 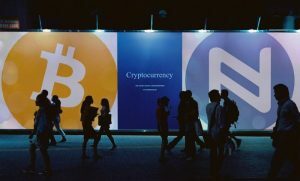 This debate has again been revived due to arrival of these cryptocurrencies, which seem to be able to offer a rule that is extremely transparent and can be exactly programmed. Finally, the limiting question of all this is why doesn’t the central bank just take this whole thing and bring this technology in-house? Rather than printing greenbacks and circulating bills and notes, why doesn’t the Federal Reserve just put everything on a national blockchain and make all of the money electronic? This is something that I think is probably going to happen. I think everybody recognizes very easily that most of the money already is electronic. You use cash, really, just for micropayments, but probably upwards of 90 percent of your actual spending is with credit cards or bank transfers or some other virtual form of transacting where you don’t actually physically pass. If it’s tracked on a blockchain, it begins to raise questions like: Do we need the retail banks to take deposits and engage in fractional reserve lending? Or could everybody just have an account at the Federal Reserve? This is an idea called the narrowing of the banking system. Again, it refers back to older ideas, many of them from the University of Chicago in the 1930s, about how you might make the whole system less risky and more reliable. Then I got an invitation that following spring to go to Basel and meet with the central bank governors in a meeting that was never publicly announced. The agenda for that meeting was exactly this. It turns that behind the scenes [this is] exactly what Janet Yellen and Mario Draghi and all of the governors of the central banks of the world are actually quite concerned about. Is this thing viable enough to be a real threat to the money that they’re issuing? 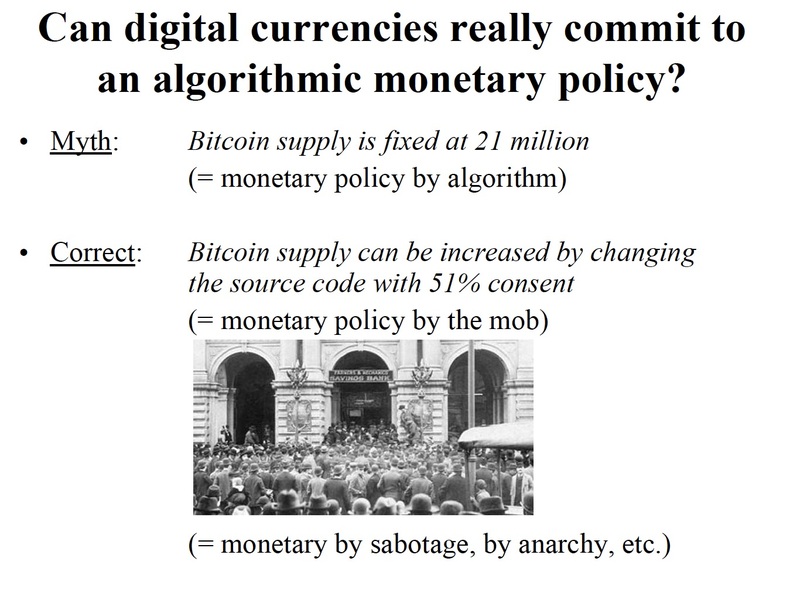 Should they think in terms of this algorithmic monetary policy? It turns out that the central bankers are far out ahead of the academics, and that this has been an issue of great interest to them for quite some time. I think it’s now been opened up to a lot of public debate. In the end, these are political questions that are beginning to interest people throughout the world. You’re likely to hear much more about these things over the next 5-10 years. The irony behind all this, of course, is that the design of the whole digital currency, and Bitcoin in particular, was meant to undermine the central banks and to compete with them head-to-head. The evidence for this comes directly come from Satoshi Nakamoto when he created the first block in the Bitcoin blockchain. This was on January 3rd, 2009. This is called the Genesis block, like the first verses in the Bible. Everybody who follows Bitcoin closely knows that the Genesis block has this message built into it, which is meant to poke fun at the weakness of, in this case, the U.K. banking system. 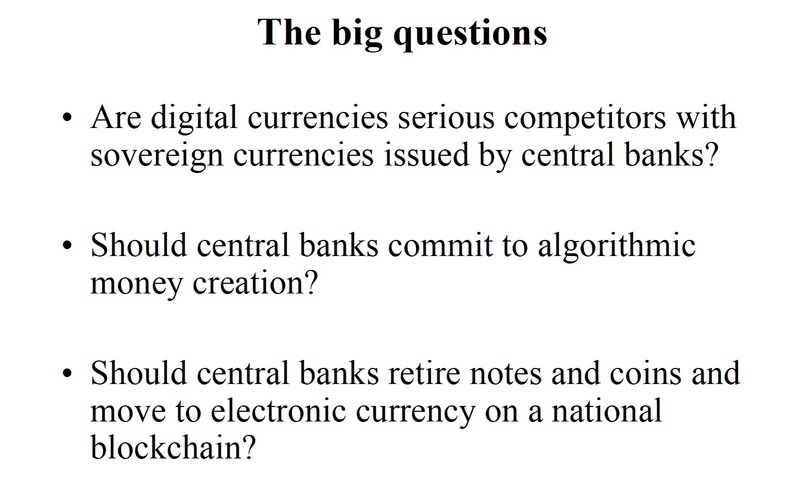 Nakamoto also went online and posted manifestos against central banks. The very famous quote is the one I’ve pulled out , that the root problem with conventional currency is all the trust that’s required to make it work. In particular, the Central Bank must be trusted not to debase the currency. 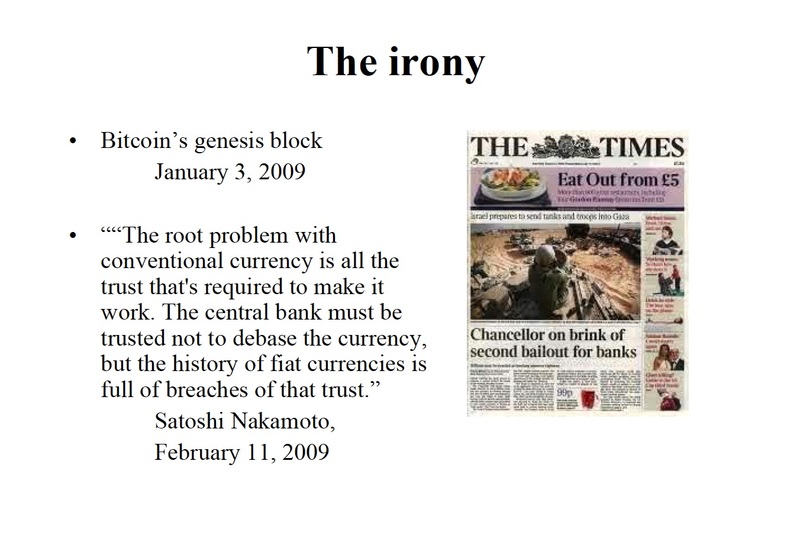 The history of fiat currencies is full of breaches of that trust. Nakamoto, very openly, was trying to create an alternative to central banks. The people who have gravitated toward this often have this libertarian anti-government streak. [In a 2014 panel] led by Nathaniel Popper of The New York Times, he pointed out that 10 percent of all Bitcoins are, at this point, in the hands of criminals who have hacked and stolen them. Andreas Antonopoulos, a Bitcoin evangelist, said “This is a vast improvement over the rest of the economy where 80 percent is in the hands of criminals: the banks.” These are people who hate the whole system, who have no patience with the current banking system, who are really trying to start something new from the bottom up. The law in this area is a little bit murky. Every country handles this issue a little bit differently. In the U.S., we have something called the legal tender laws, which go back to the period just after the Civil War, when the U.S. government was deeply in debt and began to print money and force people to accept it to pay off what, at that point, was a lot of debt left over from the war. There were two cases where the U.S. Supreme Court ultimately ruled that people had to accept U.S. dollars issued by the central government. This was prior to us having the Federal Reserve or any kind of central bank but since that time, if anybody owes anybody else a debt in the U.S. and you present government-issued money as payment, they must accept it. It’s legal tender for all debts, public and private. You’ve read this on money. What the law does not say, though, is that you can accept something else. The law doesn’t rule out other forms of money. If I owed John a thousand dollars, I could give him a thousand U.S. dollars, but I could also give him Ithaca Hours, which is a currency issued in Ithaca, New York based on the labor theory of value by a community of people who don’t like the regular money. He doesn’t have to accept it, but he could. In fact, there is all kinds of private money that circulate often in small communities in the U.S. This has been true for a long, long time. Sometimes, the government loses patience. A well-known recent case involves something called the Liberty Dollar. This is a coin that looks like a U.S. dollar, but look close and it’s not really the same thing. It says “Trust in God,” not “In God we trust.” It doesn’t mention the United States anywhere. It was issued by this man named Bernard von Nothaus, who ran an organization called The National Organization for the Repeal of the Federal Reserve. This sounds like a guy who today would be almost in the mainstream, but back in 2011 they arrested him for counterfeiting. Was this guy in violation of the legal tender laws? If so why, exactly? I’m not going to try to answer that question. This seems to be an area where the U.S. government has at least some patience with private money. Nobody suggested, for instance, that Bitcoin is illegal. [But] if you go too far, they will put you in jail and say that you are bumping up against the government’s right to issue money and so forth. The law is even more confused in other countries. The real point I want to make is that private money does exist. It has circulated since the beginning of the country. The government seems to be unwilling to let it get to enough of a critical mass that it becomes a serious threat to the U.S. Dollar. How much real money, U.S. dollars, is out there circulating? It runs into the trillions. It’s a little hard to measure because a lot of it is electronic, and based on bank balances, and to actually put a number on it is challenging for the Federal Reserve. Bitcoin is a tiny, tiny drop in the bucket compared to the volume of U.S. dollars, either the physical money or the much bigger amount of virtual dollars that exist in people’s deposits and so forth. If you go down the list of other virtual currencies, they become even smaller. Even the second biggest, which is Ethereum, the one we talked about yesterday that ran into all the trouble with the hard fork, is not even 10 percent of the size of Bitcoin. 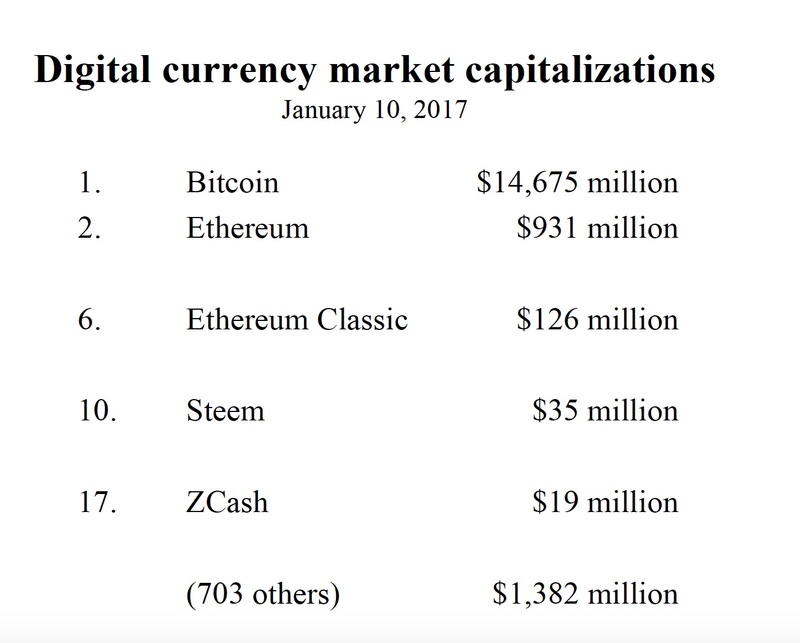 The sixth largest is the rival Ethereum, the Ethereum Classic, which is $126 million. Steem is a video game currency. It’s issued on a gaming platform where people play these massive open online games. It’s a unit that was designed to be used internally to the game but is now traded outside the game, and actually has market value. At this point, it is the 10th largest digital currency. Zcash was launched about two months ago. It got a huge amount of early publicity because it had design features that were better than Bitcoin, in the sense that there was total privacy that you could exchange this on a blockchain but nobody could actually see who you were or who held which units of Zcash. This seemed to be a very promising way for people to launder money and buy drugs in ways that would not be a good idea with Bitcoin. This thing, all the air has gone out of it. At first it was trading for $2,000 for one Zcash but it’s all but collapsed. If you come back next week, it might be 178 on the list. All of the others combined are worth about $1.3 billion. 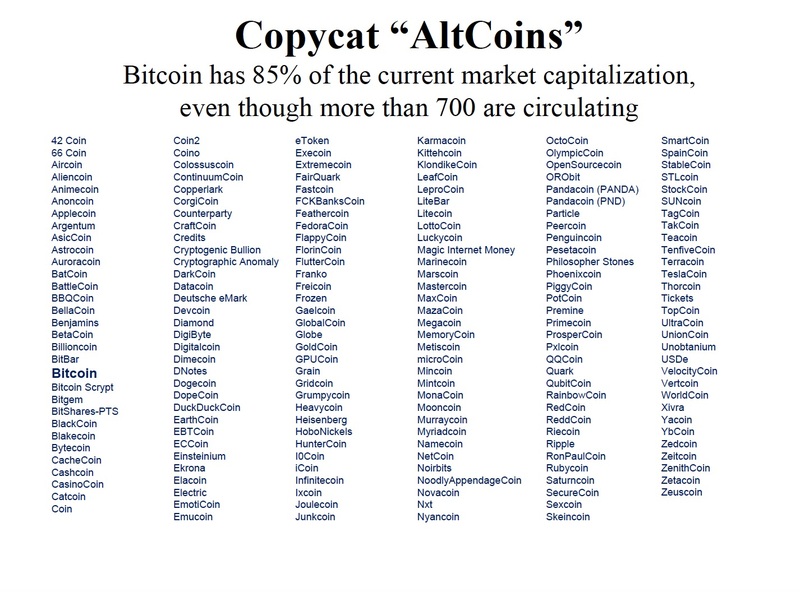 Many of these are fun to look at: Marscoin, RonPaulCoin, RainbowCoin, PotCoin, PiggyCoin. All of these are on blockchains and all of them are wannabe competitors to Bitcoin, but they’re tiny. Even Bitcoin is so small that it’s hard to take seriously as a rival to any sovereign currency at this point. As we’ve talked about earlier, with some of the constraints regarding block size and the throughput, I think there’s not going to be any serious threat that the central bankers have to worry about any time soon. You’re going to need some real advances in technology before any of this private money can be taken seriously as a competitor. At least the idea is there. It’s drawn a big audience among the libertarians. When I teach my course in New York, you get a lot of these people signing up that hate government. They think that this is part of an agenda that will make the state recede from its oppression of us in our daily lives. They had some sharp critiques of the banking system. Very much along the lines of Satoshi, they think that banks can’t be trusted. One of the great things about Bitcoin is that it gets rid of the banks. You can just keep it in your own digital wallet and you don’t have to hold it in a bank. The second point is the algorithmic creation of money, that governments always inflate the currency to the point that it’s worthless. It’s just a question of when, not if. With Bitcoin, you’ve got a set of equations and we know that this will never happen. 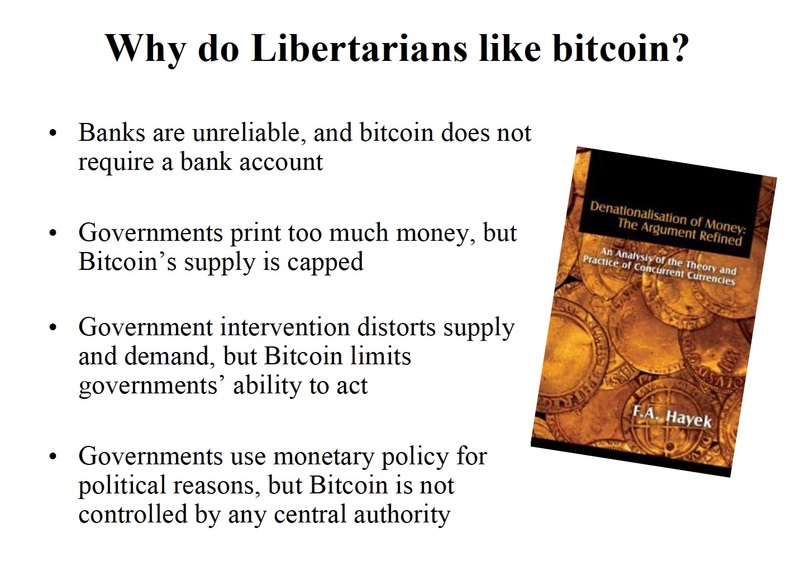 Libertarians tend to object in principle to monetary policy. They view things like quantitative easing as distortions in the forces of supply and demand and disguised subsidies, from people who know what they’re doing to people who should but don’t and are too lazy to arrange their affairs in the right way, leaning on governments for economic support. To Krugman, it’s evil precisely for the reasons that libertarians like it, because Bitcoin seems to rule out different kinds of monetary manipulation and stabilization policies that—at least in the opinion of Krugman—has proved to be very valuable in stabilizing a free-falling economy . This is a political debate and we’re not going to parse it out. Let’s look at the rate of money creation behind Bitcoin and think whether this would actually make sense for a real government to implement—if not this rule, some other rule that looks like it. What happens with Bitcoin is that the currency gets inflated every 10 minutes when some miner creates the next block and claims the reward of the Bitcoins that are put out there as the incentive. You guys are probably studying what we call “seigniorage,” which is the government printing money and releasing it into the economy. In the U.S., the central bank puts money into the economy through what we call open market operations, there’s basically a trading desk where they either sell or buy bonds from the public and thereby release cash or contract the money supply. Bitcoin is totally different. Instead, the seigniorage on Bitcoin is by way of the miner: Every 10 minutes, there’s a reward, which is 12.5 new Bitcoins or roughly $10,000 worth of money. Now, this reward was originally 50 Bitcoins every 10 minutes. It was stipulated by the code that every four years it will be cut in half. In 2009, it was begun at 50. In 2013, it was cut to 25. Then quite recently, just a few months ago, it was cut to 12.5. It’s not exactly four years, but I think in 2021, it’s due to be cut again to 6.125. What this means is, the cumulative size of the money supply is going to follow a concave function, because the reward is cut in half every four years. Then it will asymptote eventually to zero growth. 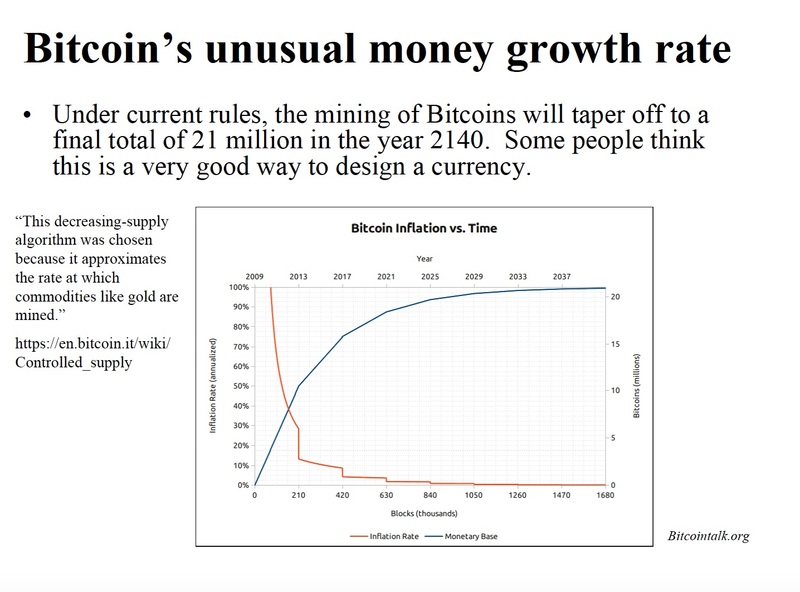 By the year 2140, you actually have to go all the way up much further, but there will be no more reward for the miners and the number of Bitcoins will be fixed forever at an upper limit of 21 million. If you go online and try to learn about why they set it up this way, you will find quotations like [the one above], that they chose this very deliberately to approximate things like the historical rate of gold mining. When people discovered gold, they took the quick and easy deposits, and then they had to work harder and harder. The growth rate, the production of gold allegedly is concave overtime. The rate of Bitcoin creation, according to the evangelists online, was designed to mimic the history of gold mining. Now, it turns out be completely false, but this is at least the legend behind it. The logic is interesting and very straightforward. It’s the kind of thing that Milton Friedman probably would have been very comfortable with. The whole idea here is that they’re worried about inflation. If you think inflation is caused strictly by the money supply, if we fix the money supply, we’ll never have any inflation. But the real point of the research of Friedman and others is not that there should be a fixed money supply, but that money should be neutral. What that really means is that money should grow at the rate that the economy grows. What you’re looking for is not a stable money supply but a stable price system. If the economy grows exactly three percent a year and money grows three percent a year, then prices shouldn’t change. That’s a somewhat different idea than what these folks have in mind. What you would get with a rule like this, in my opinion, is deflation. If you just fix the amount of money and the economy grows two percent, you’d have to cut everybody’s wages by two percent. If I cut yours only one percent, I’d say you got a raise and you’d have to think, “Yeah, I’m better off because everyone else dropped two percent.” That would require people to change a lot of their behavioral frames of reference. Maybe, over the course of hundreds of years, people could adapt to that and think a little bit differently about what it means to be better off. Ultimately, if you’re hoping that the economy will grow, having a fixed money supply or a very low rate of growth is going to force prices to drop at the rate of economic growth every year just to stay even. Nevertheless, if we can look at this rule and know exactly what it is, we can plan around it. This debate about rules versus discretion says that above all, people want certainty. Whether it’s going to be fixed or whether I know for sure [that] it will grow 10 percent a year, as long as I know what it will be, I can then write my debt contracts and building price. I can do whatever I need to do without a risk of the government devaluing my money beyond my expectations. 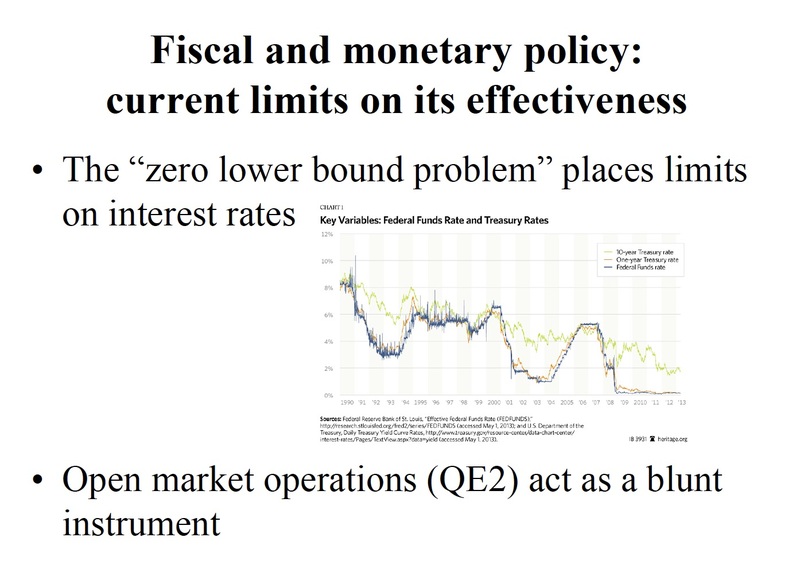 There are things like the Taylor rule that you may have heard about in macroeconomics, that stipulate what an optimal monetary policy might be if the central bank could tie its hands and commit to it. By announcing 100 years in advance what money creation is going to look like, you’re giving people all the information they need to write debt contracts and arrange their economic affairs the way you would want. It would be the case that governments would be not only deterred, but [it would be] impossible for them to use monetary policy to stabilize the economy. It turns out you can get good data about historical gold production, back to the times of the Egyptians. The rate of gold production has been convex and not concave in history. In fact, in the last couple hundred years, the rate of gold production has accelerated in a way that is completely at odds with what they have in mind for Bitcoin. Ultimately, though, what you’re talking about here is going back on the gold standard. The logic of this is very much what the logic of monetary policy was throughout the world, at least up until the time of the Great Depression. We could call this the gold standard, or more broadly a commodity standard, where the money issued by the government is constrained by the supply of some real good, which typically has been gold throughout history. For the government to expand the money supply, they either have to dig more gold out of the ground or more likely buy it from some other nation, or take it as booty during wartime or something like that. The way you expand the money supply is by expanding the stock of gold. The virtue of this, again, is limiting the ability of the government to debase the currency. If you have a gold standard, and it used to be the case that in the U.S. $32 could be traded for one ounce of gold, this was thought to discipline the government and protect the wealth and functioning of markets. For many years, this was the central issue in our politics. The height of this was the Populist movement, which culminated in the 1896 election, 120 years ago, when this young lawyer, William Jennings Bryan, ran as a Democrat against the Republican William McKinley. Bryan made the very famous “Cross of Gold” speech, saying that the gold standard was tyranny and that the government should print more money to support farmers and working people. He was not the first or the last person to go down this road. There was something called the Free Silver Movement in the 19th century, also called bimetallism, [which] essentially argued to expand the monetary based by making not just gold but silver the basis of currency. You may or may not know that in the Wizard of Oz, this beloved children’s story, the wizard is in fact the gold standard. The Yellow Brick Road and the Emerald City, this is all based on the Populist movement and it’s an allegory for the tyranny of the Republican party back in the day. It took until 1971, when Nixon finally took the U.S. permanently off the gold standard, that this was resolved in favor of paper money and discretion for the central bank. This is a big debate, and what a lot of the Bitcoin sponsors are trying to do is essentially reintroduce this argument. The gold standard collapsed for the reasons that I suggest that Bitcoin’s concave growth rate would run into trouble [because] it didn’t grow fast enough. They didn’t discover gold quickly enough to accommodate the growth of the world economy. The gold standard, you may be surprised, [was] invented by Isaac Newton of all people and introduced by the Bank of England in the 1720s, and it lasted about 250 years. In times of war and in times of economic crisis, it was periodically suspended because it became a serious obstacle to economic stabilization in world wars and depressions. Ultimately, despite the last stand to save the gold standard by John Maynard Keynes at the Bretton Woods Conference, by the 1970s everyone agreed it just wouldn’t work. I think this idea of algorithmic monetary policy, whether it’s through Bitcoin or through the central bank, in the end, is not going to happen. There are too many good reasons we already have not to use it. It’s worth pointing out that the governance of the digital currencies themselves probably wouldn’t support it. The belief is that the supply of Bitcoins is fixed at 21 million and that’s all there can ever be. This is true if you look at the Bitcoin code, but the reality is that the code can be changed. The blockchain can be forked if 51 percent of the people agree to go down a fork. Somebody tonight could say, “Let’s change it from 21 million to 30 million.” If you can get people to follow you in the direction of a different limit, the 21 million would be gone. What this reduces to is essentially mob politics. I told the central bankers that this is monetary policy by the mob: “They’re trying to replace you with rabble-rousing charlatans.” Everyone agreed that this is far worse than the enlightened central bankers. Should the government make all the money electronic? The important first point is that this isn’t such a radical idea because money already is electronic. Through credit card companies and mobile payments and bank transfers, we’re all pretty used to living this way. What would really change is that the system of fractional reserve banking that we use to create most money would be gone. The real thing that would change in your personal day-to-day behavior is that you wouldn’t use cash for micropayments, for Starbucks or whatever. What would be the benefits to the central banks from making all the money electronic? Some of these are very simple to see. First, you wouldn’t have to print the money and you wouldn’t have to guard it with Brink’s trucks and things like that. The direct cost of printing, storing, [and] safeguarding the money would simply go out. The much more interesting savings would be through the implicit insurance systems. I think the number one saving is to get the government out of the deposit insurance business, which at times has been really expensive and creates moral hazard problems that I think you’re all pretty familiar with. The government would also have a very precise lever over economic policy, where it would have the bank account of every citizen and could manipulate policy, like giving tax cuts only to students or only to people living in Idaho, or only the people who voted for their party or whatever. Would we want the central bank to have this much power? It’s an interesting question but I think from the point of view of the central bank, it’s a tool that is very attractive. Things like tax evasion and money laundering would be completely gone. If all the money’s electronic and being tracked on one blockchain by the central bank, they would just take the taxes. The whole concept of money laundering wouldn’t exist. Let’s look at some of these things in a little more detail. What does it actually cost to run the system we have now? 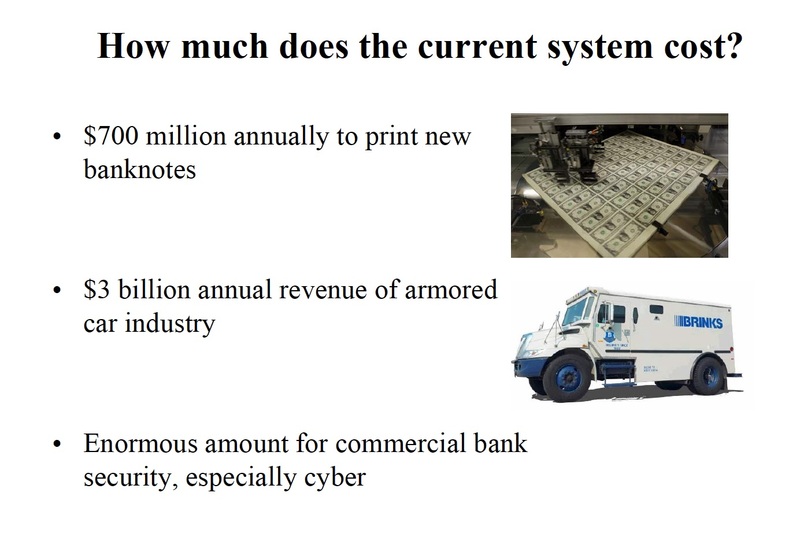 The government spends $700 million a year actually buying paper and green-inking, printing the money. This is not very much, relative to the hundreds of billions that get issued every year. So I’m not sure that this is particularly compelling. Then, there’s private industry, the armored cars and so forth. The revenue of that industry, which you wouldn’t need anymore, is $3 billion. The big cost is computer security. This is very decentralized. Every commercial bank has an army of people defending against hackers. This is a soft cost that you’re all paying in the background, but it’s a big one. It’s hard to even put a number on this. 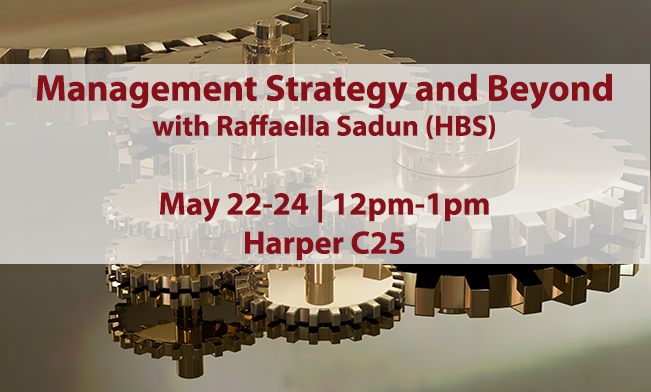 I know that in risk management courses in business schools these days, what we call cyber risk is now a huge first-order topic and that’s really what the savings would be. It’s a number that I really can’t quantify myself but I think it’s probably pretty big. This is a bank taking in a deposit where there’s a 10 percent reserve requirement. If someone puts in $1,000 dollars, you have to keep 100 in the bank, but you can lend out the other 900. You lend it out and then it gets lent again with a 10 percent reserve, so the amount of money that’s created is one over R, where R is, in this case, 10 percent—the reserve requirement sometimes called the money multiplier. We’ve had this system since the beginning of time. The banks had never had a 100 percent reserve requirement, and governments manipulate this to stimulate or contract the economy as they think is necessary. But this is, of course, dangerous: What if people actually show up and want their money? This is what’s called a bank run. We used to have these in the old days. I love this slide, because nothing’s changed in the world, right? That’s in the U.K. just a few years ago. It looked exactly the panics that we had back in 1873. Despite very sophisticated national schemes, this problem has never been terribly well solved. If we have fractional reserve banking, the government has to backstop these banks and guarantee the deposits, which means that we all pay for it when somebody like Northern Rock doesn’t have enough money because they made too many bad mortgage loans. What’s the cost of deposit insurance? We have a well understood scheme in this country, run through the FDIC. I think you all know that your deposits are insured up to $100,000, but everyone also believes that that’s not a serious limit. The idea that a bank is too big to fail means that the government will pay all the bills, not just the first $100,000. We now have the Dodd-Frank Act, where banks have to write living wills and promise not to get into too much trouble. Banks a have free put option, meaning that if they can’t meet their liabilities, they can put them on the taxpayer. Every banker knows this and as a result, bankers take too much risk and from time to time we have to pay the bill as a society. 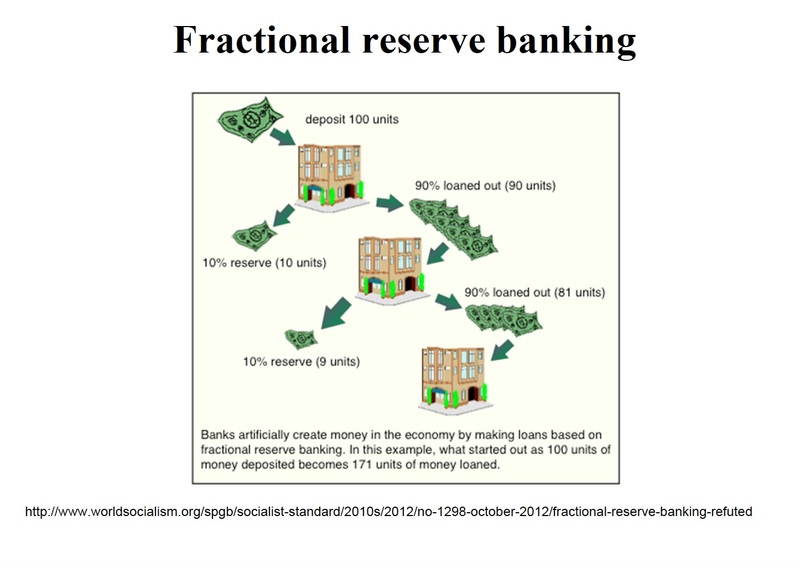 If you did away with the fractional reserve banking system and just let everybody open an account at the central bank and bank directly one-on-one with the government, you would save what is an enormously expensive and pretty ineffective system. I might not have made these remarks 10 years ago, but having lived through all the bailouts and the financial crisis, and looking even today at what’s going on in Italy, there are banks all over the world in reputable countries that are teetering on the verge of collapse because this is an inadequate system that has not worked well for people. 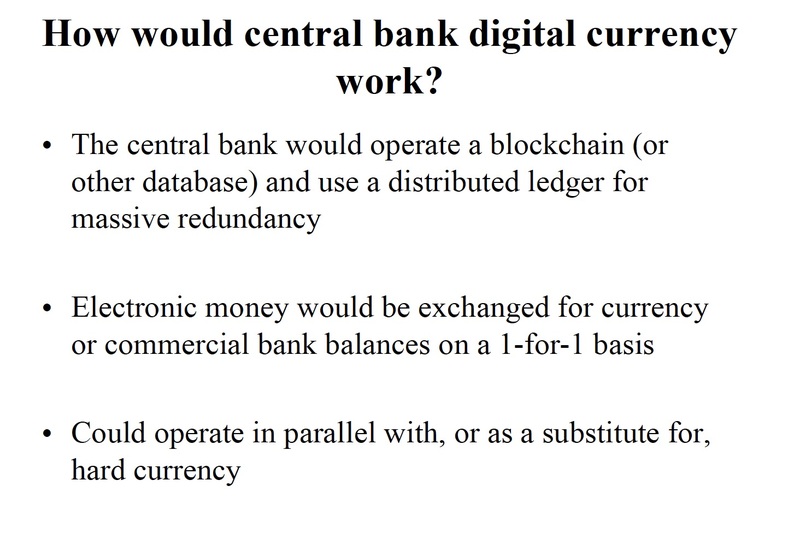 If you ask me should central banks get into the business of a national blockchain? I would say yes, and this would be my reason: this [current] system is showing itself to be so problematic and so expensive to the world. You often hear the objections straight off: “You mean you would take all the deposits out of the commercial banks? They would collapse. They would all be gone.” What would this mean? I say this would be very good, because we wouldn’t have to bail them out anymore. Every month, my paycheck goes into Bank of America, which is a bank that failed three times in the year 2008. Would I rather deposit in the Federal Reserve? Sure. In fact, everybody would rather do this. And if Bank of America wasn’t there anymore, would I care? People say ‘well, there would be a lot of unemployed bankers.’ Well, OK. The real issue is that Bank of America takes my paycheck and lends it out, so they make car loans, mortgage loans, small business loans. They provide credit. Banks really [do] two things: They take deposits and process payments and so forth, but they also provide credit to the economy. What people imagine, and what the Bank of England’s Future of Money team has written a lot [about], is that you would still have companies in the lending business, but they would have to fund themselves very differently. Bank of America funds itself today—I’m not picking on them, it’s also true of Chase and Wells Fargo, pick your bank—basically by getting demand deposits and then availing themselves of the free deposit insurance from the government. They would instead have to issue debt and equity. They would issue securities, one presumes, with a much longer maturity. One of the big problems in banking is what we call maturity transformation. The banks fund themselves through demand deposits with very short-term liabilities. It must be repaid on demand, but they lend long. They make a car loan with a four-year horizon or mortgage with a 30-year horizon. It’s that mismatch of maturities which is the foundation of the problem of bank runs, and banks that sometimes overextend themselves and can’t easily dig themselves out of positions. There is a ready-made solution to this. It’s sometimes called the narrowing of the banking system, where instead of branching out through fractional reserves and lending and re-lending the money, you would go directly against the government as a depositor and the whole system would be narrowed to just depositors and the government. The narrowing of the banking system was an idea that was proposed back in the 1930s under something called The Chicago Plan. It came right out of the faculty of this university and was largely forgotten for about 80 years until it enjoyed a real renaissance and revival in the context of this discussion. When I taught my course for the first time, I had actually never heard of the Chicago Plan. I had these libertarian students say, “Yes, we’re going back to The Chicago Plan. 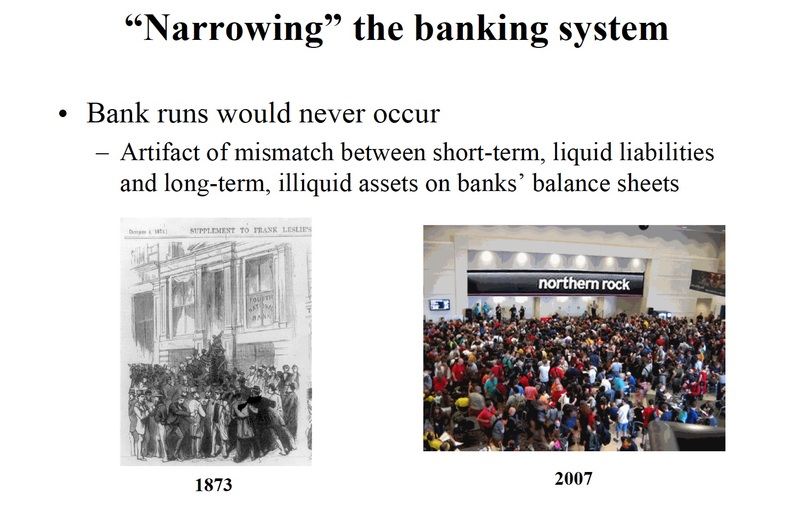 Finally, after 80 years, people see the wisdom of this.” The narrowing of the banking system is now something being openly discussed in a lot of academic papers. The whole benefit to it is really taking all this risk and moral hazard out of the system. As of 2008, you see that there’s been a barrier at zero. The government would have wished to pay lower interest rates, but the public can defeat a negative interest rate by just holding cash and putting it under the mattress. Cash yields zero. If you’re going to pay negative interest rates, everyone’s just going to hold cash. Not electronic money. With electronic money, they can just erase one percent of your balance every week, or whatever they feel they need to do. There’s a very provocative speech given by a man named Andy Haldane, the chief economist of the Bank of England, where he hones in on this issue. The speech is titled “How Low Can You Go?” He said central banks not only want to pay negative interest rates but for demographic reasons, this is going to become more and more necessary, because of changes in population growth. He said the only way to really do this is with electronic currency, because otherwise people are going to hoard cash. As a matter of economic logic, this is a pretty compelling case, that in a world where negative interest rates are popping up more and more, the only way to administer this monetary policy is to take the physical cash out of circulation and make it electronic. I think you’re going to see more negative interest rates and more pressure for central banks to make the money electronic for exactly this reason. The other aspect of this is that in addition to interest rates, you can have finely-targeted monetary policy. Today, when the Fed does things like quantitative easing, it’s benefiting the whole economy very broadly, but you can’t really target it at any region or certainly not at any group. If people have electronic accounts at the [central] bank, you can have regions targeted, demographics targeted. You could cut taxes to women, or to different ethnic groups, or to people over certain age, or whatever. It would give an awful lot of power to the central bank. You may or may not want them to want this power, but it would certainly permit much more finely-tuned, targeted monetary and fiscal policy. This is a really big issue, but it’s one that the technology is now forcing us to think about as a possibility. I’m running out of time, so let me just tick off a few objections. I think many of these will have occurred to you guys already. Privacy, again, becomes a big issue. If the government has everybody’s bank account right in front of them, it’s impossible to hide. Not only that: If it’s a blockchain, maybe we can all see each other’s purses. I would say that the IRS has actually been pretty successful at keeping tax returns private. You almost never hear about people’s tax returns, not even the president’s. For that reason, I think that the government could probably design safeguards to keep accounts private in a way that you wouldn’t worry about this so much. Political power: Central banks are already very powerful, but in a system like this they’d be much, much more powerful. In fact, probably much more important than Congress and the President. This is something that’s going to give people a lot of hesitation. Do you really want to give them levers that are this strong? I think this is a discussion well worth having. What about people who can’t use computers? There’s a lot of older people who can’t do email. I don’t really want to pick on my parents, but they went to Harvard and MIT and if you ask them to attach a file and send it to you, it’s just not going to happen. At least, not so easily. Rich people tend to be older and they tend to be less comfortable with computers. If we threw a switch and said, “Tomorrow all of the money’s electronic and you have to do it on your cell phone,” this would cause many problems. How to transition people who are less comfortable with digital stuff into using this system? I think it’s maybe a 20-year project and you’re probably going to have to run these things in parallel and keep the old system going. You couldn’t just get rid of all the electric typewriters the day the word processor was invented. There’s a transition period. Finally, this is the big problem for the U.S.: Where is most of the U.S. cash? It’s offshore. This is our greatest export. We print these green pieces of paper. We export them, we trade them for goods and services and they never come back. Instead, they’re held in suitcases by criminals and rogue governments and so forth. If the U.S. were serious about defeating money laundering, you would just get rid of the hundred dollar bill, the way the Europeans are getting rid of the 500 euro note next year, but we would lose an incredibly valuable export industry. No other country really has this problem, but you would have [a] trillion dollars of dirty money held by people who would want to bring it back onshore and put it on the Federal Reserve’s blockchain. Would we accept this money? For this reason, I don’t expect the United States to be the first adopter. I think we may get dragged into the parade but it’s going to be some of the smaller more tech-savvy countries. Singapore looks like a really good candidate for this, but some of the Nordic and the smaller European countries are probably going to do it. The U.S. eventually will have to do it, but probably not until Canada, England, Australia and so forth have already implemented it. This is going to be a very, very interesting thing to watch. It’s going to revolutionize central banking and monetary policy, probably over the horizon of 10 to 20 years. As I said before, it’s hugely ironic that the innovation of Nakamoto, in the end, is going to be coopted by exactly the same central bankers he was trying to do away with—so stay tuned. Blockchains and Corporate Finance: “In a Blockchain Market, Shareholder Activists Might Play Much Less of a Role” Where Will the Crypto Craze Lead? A Venture Capitalist’s View Does the Growth of Bitcoin Have Anything to Do with Distrust of Government?